CLICK THROUGH TO LEARN MORE AND START SAVING! Join the 1.5 million Canadians already saving and get your card today. 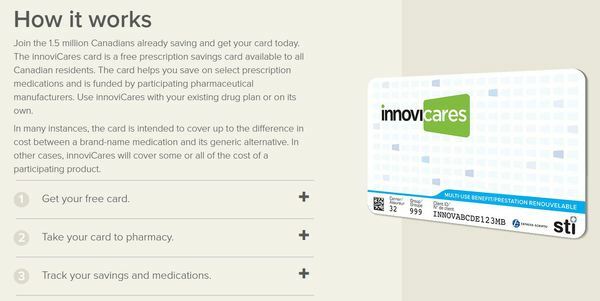 The innoviCares card is a free prescription savings card available to all Canadian residents. The card helps you save on select prescription medications and is funded by participating pharmaceutical manufacturers. Use innoviCares with your existing drug plan or on its own. In many instances, the card is intended to cover up to the difference in cost between a brand-name medication and its generic alternative. In other cases, innoviCares will cover some or all of the cost of a participating product.